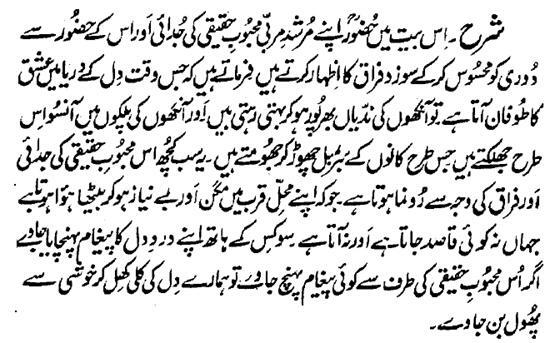 Here Hazrat Sultan Bahu Rahmatu-Allahe Ta-aala Alaihe expresses his ache and Firaaq feeling the farness and separation from the Hazoor of his Mentor Murshid and the Real beloved . He says that 'when the Great Flood of Ishq lashes in the river of heart, the springs of eyes run with full water and tears rush from the eyelids. All this happens in wake of the separation and partition from that Real beloved , who is sitting careless enjoying in His Palace of the Qurb where neither a messenger goes nor does he come from it. Hence, who can be the one through him one can deliver the message of his pained heart. If some message from that Real beloved arrives to us, the bud of our heart will blossom into a flower!